Anyone who has ever given a gift, volunteered or otherwise “paid it forward” can attest that giving to others provides its own gifts in return. Bestowing a gift on a loved one brings us joy, while charitable work or donations makes us feel good about ourselves. Its value is two-fold: while helping others you can simultaneously improve your own physical, mental and spiritual well-being. A 2008 Harvard study, “Spending Money on Others Promotes Happiness,” (.pdf) speculated that “how people spend their money may be at least as important as how much money they earn.” More specifically, the study hypothesized that spending money on others brought about greater happiness than spending money on oneself. For Christians, happiness in tithing is not about scientific data. It is about the joy that comes from a personal relationship with God, and the pleasure of obediently giving a little back to the one who not only gave it all, but who continually meets our daily needs. What does that mean? It means that although giving to others makes us feel good, giving to people we are close to brings even greater happiness. What does that mean for tithing? Christians experience close ties to their church and church members, so tithing – giving to strong social ties – brings great happiness. In addition to happiness, tithing also helps bring about a communal sense of financial security. It’s a give-and-give-back situation. Members tithe to the church, which in turn takes care of members in need. Members who have fallen on hard times can once again find success thanks to the church’s support in their hour of need. 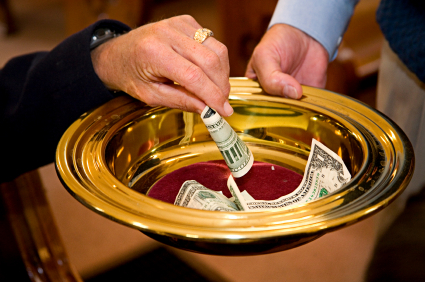 A 2008 Arthur C Brooks study found that monetary giving (like tithing) actually influences income. In fact, he found that giving and income have a circular relationship: the more we give, the more we prosper and the more we prosper, the more we give. Christians understand that giving back to God isn’t so much a quid pro quo situation but, rather, more a reshuffling of priorities. Giving away 10% of our income helps remind us that all prosperity – financial or otherwise – comes from God. Furthermore, it is a reminder that prosperity is not limited to our income, that many of life’s blessings can be experienced with or without a Fortune 500 paygrade. Tithing refocuses our priorities on the things that matter: our relationship with God and our relationships with others. Ultimately, those who have experienced the joy and blessings that come from giving will neither need nor be surprised by this recent scientific validation. As for the skeptics, the results are in: tithing brings success and happiness. Editor’s Questions: How does giving affect your attitude? Do you give 10% of your income to the church or other charitable organization? Do you sense that the more you give the more you prosper? Anum Yoon is a blogger with a passion for Christ. Since her childhood, she was brought up to commit to the practice of tithing, and believes it to be part of the reason why she chose to become a personal finance writer. She firmly believes that volunteering to help others will help you find joy in life. You can find Anum on her personal blog, Current on Currency, and subscribe to her blog newsletter right here. My Husband and I have been tithing but since we started tithing 10 % and even over a little we have had some not so positive things happen financially and personally. We have committed to 3 months. Has anyone else experienced this at the beginning? I don’t think what you are experiencing is unique to you. We’ve all had tough situations that compound one upon another in a short period of time. That’s why it’s so important to build an emergency fund to handle them. You can read about that here: https://luke1428.com/emergency-fund-basics-the-step-on-which-all-other-success-is-built/. Another thing to think about is that your circumstances may be a test of faith. I have no idea what God is doing in your life but I know in the past He has sent situations my way to challenge my convictions and make me stronger. I do find it interesting that your problems compounded the moment you committed to start giving regularly. As long as your daily necessities are being met I’d continue to give…I believe the Bible when it says you’ll be blessed by it in the long run. This really happened. My wife and I heard a message on tithing and decided even though all we had to our name was 1200 dollars. Bills were due and we had no groceries. We decided to write a check for $ 120.00 ten percent of what we had. That very day our phone rang on a Sunday afternoon it was from our adoption worker working on a sunday. She was reviewing our adoption subsidy and found out for ten years we had never had an increase in child support. She informed us we were entitled to all the subsidy and she was sending us a check for $12,000 that we had been shorted over the years. God took our $120.00 and gave us $12,000. In return. Great point about giving to stronger social ties. That’s part of the reason I prefer to give to local causes/friends in need rather than a faceless organization. It’s great when something you do out of obedience turns out to be the best choice, anyway! I think the biggest benefit to me of tithing is that it keeps me from becoming a total miser. I definitely see the tendency in myself to want to hold on to every cent and not let any go, so the discipline of tithing has really worked on that mindset. I don’t think we’ve prospered in terms of additional income necessarily, but I believe we feel and think of ourselves as wealthier because we tithe.